All AOG grills are manufactured right here in the good 'ol U.S.A. Some features are exclusive to the 24" model, like: 24 x 18 primary cooking surface with 432 square cooking inches to cook a lot of food at one time! 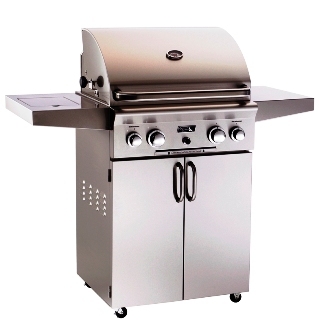 Plus it has a powerful 32,000 BTU's of cooking power AND a 10,000 BTU backburner. This unit is a cart model with stainless steel cabinet cart included! This cart model also includes a Stainless Steel cabinet cart which offer plenty of storage below! Cart includes a 12,000 BTU side burner with brass control valve and infinite control settings plus ignition system! For LP gas, order conversion kit CK1NAT for natural gas conversion.